If you find yourself feeling more stressed out than usual over the holiday season, you’re not alone. In fact, most adults may feel more effects of holiday stress than they do holiday cheer. In a 2015 Healthline survey, 62% of adults reported the holiday season to be either somewhat stressful or very stressful – with only 10% reporting no stress at all. 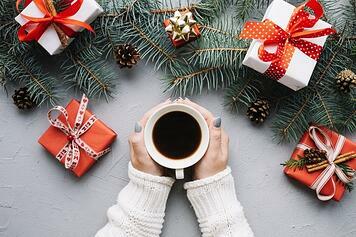 Between spending too much cash and nibbling on too many festive cookies, the holidays can negatively impact our mental health with feelings of stress, guilt, or anxiety. However, we believe you can feel more joyful and less stressed by learning to prioritize your mental wellbeing over the holiday season. Jam-packed schedules are one of the leading causes of feeling stressed and anxious over the holidays. Learning to say “no” and maintaining a reasonable schedule of events and activities is key to a healthier holiday season. Determine which parties and gatherings are most important to you, and politely decline the rest. Only commit to plans that you are comfortable with and that will make you happy. Take a break from people-pleasing. To prioritize your mental health, you need to start putting yourself first. Sure, the holidays are all about your loved ones. But that doesn’t mean that you have to stress yourself out trying to make sure everyone is happy and everything is perfect. Remember that no matter how hard you try to plan the “perfect” holiday, there will always be someone who finds something wrong. This is normal. Learn to take things less personally, and stop internalizing other peoples’ negativity. Create a personal zen space. This is especially important during family or social gatherings. Find a comfortable, private area that you can retreat to if you start feeling overwhelmed. If the gathering is at your home, even better! Designate a room that you can politely excuse yourself to when you need a break from all the hustle and bustle. Try meditating or listening to relaxing music to help you release some stress before you get back to the party. Learn a deep breathing exercise. Breathing techniques are especially important around this time of year! Learn a deep breathing exercise to practice whenever you start feeling a bit tense. Many years of research support the stress-reducing benefits of deep breathing. Check out a quick, calm, deep breathing exercise here. Self-care is incredibly important when it comes to your mental wellbeing – and it’s something that many of us don’t practice enough. Even though the holiday season can get crazy busy, be sure to schedule in some downtime to practice self-care. Treat yourself to a massage, go on a date night with your partner, or simply watch your favorite movie. Do a little something each day that you truly enjoy doing. This one is a total win-win. Not only will regular exercise help you burn off those extra holiday calories, but it will also give your mental health a big boost. Exercise has been proven to be one of the best ways to decrease stress. It can also help reduce your risk of depression and anxiety. Try to aim for 30 minutes of exercise every day to achieve mental health benefits. Check out these tips for staying active even when it’s cold outside. Check in on your mental health. Because we are so busy over the holiday season, many of us forget to check in with ourselves. After a hectic day, ask yourself how you are feeling. How are you feeling emotionally, mentally, and physically? We suggest writing down these thoughts in a journal to help yourself keep track your wellness. If you notice that you’ve been feeling more stressed, depressed, or anxious than usual, schedule an appointment to meet with a healthcare professional. Don’t just let these feelings build up. The best gift you can give yourself this holiday season is the gift of prioritizing your mental wellbeing. Remember that no holiday is perfect and you should strive for joy rather than perfection. Pay attention to your stress levels and know when to take a break from it all. We hope these tips help you and your family enjoy a mentally-healthy holiday season! How do you prioritize your mental wellbeing over the holidays? Comment below!